The NEXT STEPS business owners & service providers need to take to FIND, CONNECT & CONVERT ideal clients! Imagine - building your DREAM business with a pipeline of ideal clients who have been referred by a quality circle of influence. You'd like access to a page out of the “get-quality-prospects-into-your-pipeline-faster” playbook, right? Take the next step in building your dream business by getting your network to do some of the heavy lifting for you. Massive business growth happens when you have a solid system of gaining AND retaining quality referral sources. Your business relationships mean everything to your bottom line. And, when you can focus on building relationships with people you are the most likely to support you in your goals (and vice versa), you will see amazing results. The DREAM Growth plan has been proven and tested by hundreds of business owners and service providers in nearly every industry. 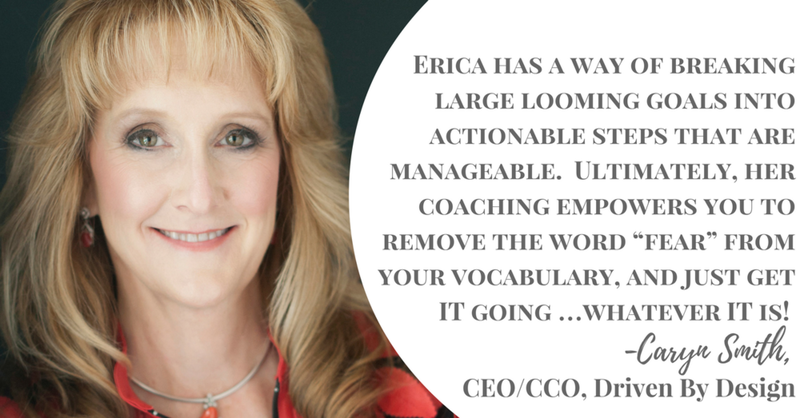 From professionals who are just starting to build their network to well established and respect leaders have all found success in creating DREAM Business Growth through Erica’s simple system and dynamic coaching. Don’t let the thought of “growing your business” sound like it’s going to be an overwhelming and complicated process. Based on a philosophy of highlighting the unique value you bring to your circle of influence, you’ll create transformational “win-win” partnerships that will dramatically increase the impact you're committed to making. You see, once upon a time, I used to flock to a ton of events. Sure, I was meeting a lot of people and making friends. I was also getting burned out. I wasn’t seeing a return on my investment of time spent on these activities. I considered, what’s the point of networking? But, it wasn’t until I started asking myself, “WHO is my message for and am I getting it in front of those people?”. This was my pivot and I want to give you some things to consider, for yourself. Create awesome habits that will sustain your success for the long haul! You're on a mission to serve more people with your service and I have THE way to help you maximize your time, energy and efforts. Wouldn’t it feel good to get ALL your thoughts about how this business is going to get off the ground into a systemized, "I-know-what-my-next-steps-are" roadmap? Here's your invitation for you and I to master the art of these five steps...TOGETHER! Let’s get you from “dreading your workload" to “building your DREAM business." You when register for your private "DREAM Business Growth Plan", you'll get an email to invite you to book your first of twelve sessions. To maximize our time, our private sessions with be conducted via video conference (Zoom), so you never have to worry about a hectic commute AND you can get back into your work....FASTER. You're also going to access to the "Unlock Your Full Potential" Questionnaire. There will be instructions on how to complete this, prior to our first session. This will help me serve you better. Before we wrap up our first call, you and I will schedule the next session for a date approx. one week after our first call. The DREAM Growth Plan investment is $2,997…and trust me, it’s worth a heck of a lot more than that. This tool will help you track your communication with your strategic partners so that your most valuable referral sources never slip through the cracks. The tool will also assist you in knowing which business building activities are the most lucrative for you. Comes with video tutorials and bi-weekly "networking best practices" e-series. To acknowledge your ability to take decisive action and for making the time to be here with me today, you can enroll in the DREAM Business Growth Plan for just $2,497 and save $500. What would one new QUALITY referral partner, that sent you one client a month, be worth to your business? It's time to leverage the power of your circle of influence to maximize growth and impact. Book today and receive the additional bonuses: The "Stand Out From the Crowd" Toolkit and the Special Reduced Investment rate of $2,497. You've got this! Enroll in the DREAM Business Growth Intensive, plus receive three special bonuses, all for the special rate of $2,497.00! What if I don't have a lot of people in my network? That's okay. The DREAM Business Growth System focuses on the quality of the relationships vs. the quantity of contacts. What you've probably been taught is that the bigger your network, the bigger your business. That's not always the case... especially if you have a high touch, high level of service you provide to your clientele. What if I have questions in between sessions? After each weekly 45 minute session, I ask you to carve out an extra fifteen minutes for you to send me an email with: the highlights of our call, the most impactful take-away you learned and the two action steps you are going to take in the next seven days. I am available for email/text support, in between sessions. Of course, if there is something that requires more than a few emails and texts to figure out, when can schedule a mini-phone chat to answer a more complex question. 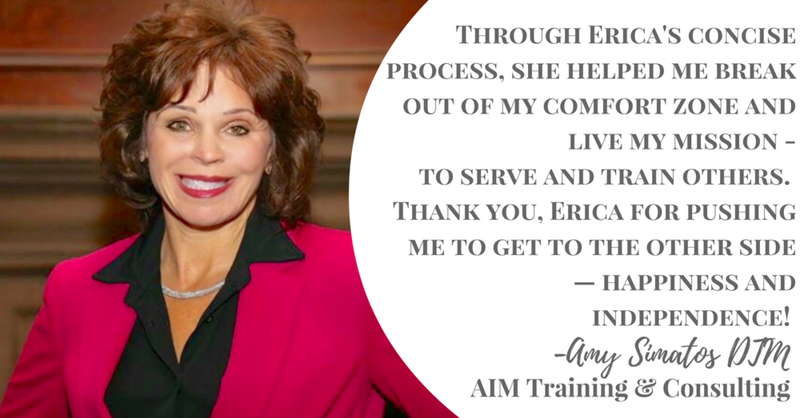 About Erica: For over two decades, Erica has helped business owners and service providers enhance their circle of influence to find, connect, and convert their ideal clients. In addition to working with small business owners, Erica has had the privilege of working with (and for) nationally recognized brands such as: Lancome Cosmetics, Victoria's Secret, Sprint and the Miss America Organization, just to name a few. To acknowledge your ability to take decisive action and for making the time to be here with me today, you can enroll in the DREAM Business Growth Plan for just $2,497. The DREAM Growth Plan is the next best step to helping you find connect and convert more of your ideal clients. Sign up now! Time to ROCK Your Business Goals! Be one of first five people to enroll in the DREAM Business Growth Plan, plus receive three special bonuses at the teleconference enrollment special rate of $2,497.00! Stop dreading all the work it's going to take and start DREAMing about the possibilities! You deserve success without unnecessary stress. Empower yourself to take this step to getting the life and business you absolutely desire! What are you waiting for? Sign up TODAY!